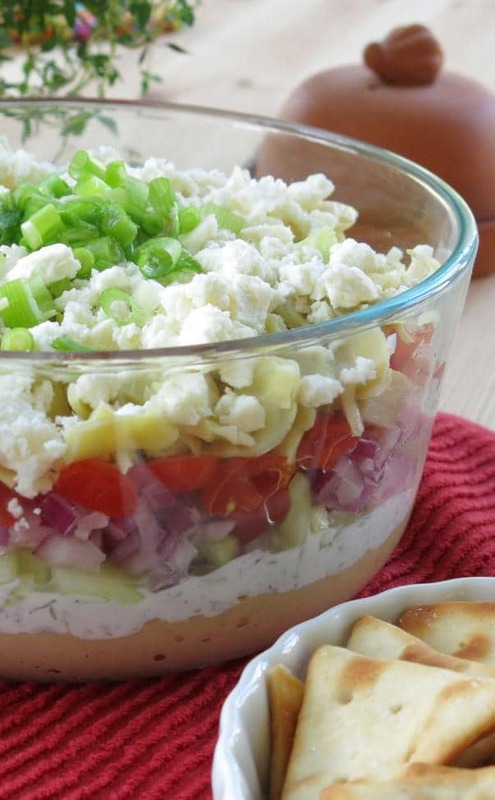 This healthy Greek dip recipe has 7 plus layers. But, I’ll show you how to pile it even higher or make short stacks. It all depends on what’s in the fridge and your favorite ingredients. This pretty looking combination of Greek-inspired ingredients was thoroughly enjoyed as we watched the Oscars this past weekend. I enjoyed the leftovers in a wrap the next day. It’s truly a guilt-free pleasure! I’m going to walk you through the dip I made and then overload your senses and taste buds with endless possibilities to customize it. The base of this dip is hummus. Buy a prepared container from the grocery store or whip up your favorite homemade version. This one is based on the 5-Minute Hummus recipe at Real Simple. The second layer is yogurt dill sauce or “Tzatziki Sauce” which sounds much fancier…don’t you agree?! 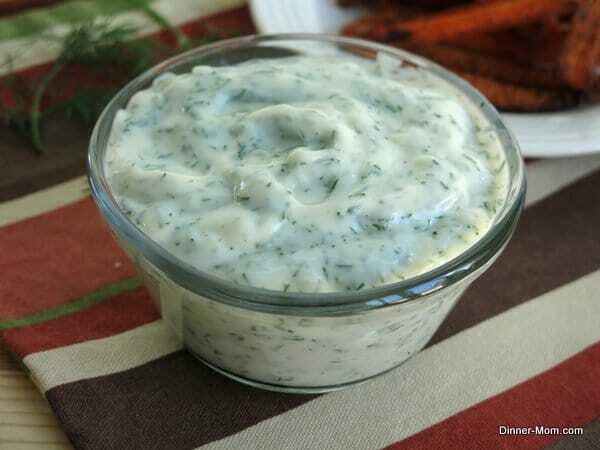 It’s a simple mixture of yogurt (plain or Greek,) lemon juice, garlic, and dill. By the way, Spicy Carrot Fries are absolutely delicious dipped in this sauce. 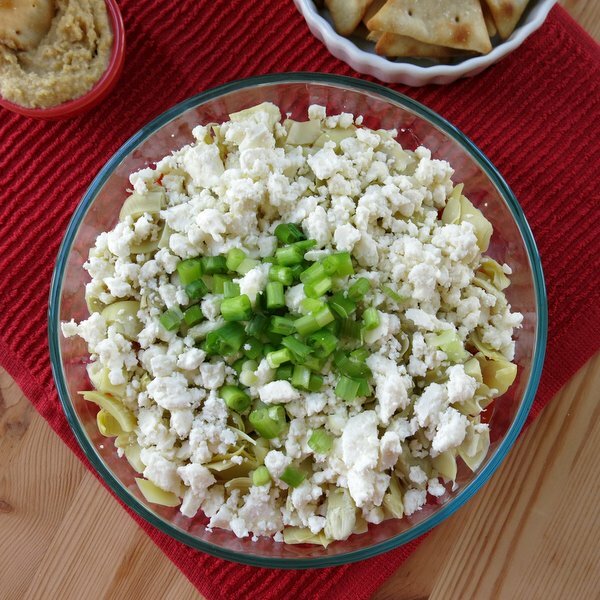 The “wet” hummus and yogurt dill sauce layers will meld and liven up all the other ingredients you pile on top. This is the fun part. And toppings like parsley, oregano, mint, and nuts. You are only limited by your imagination and maybe the size of your bowl. In case you’re wondering, I used a 7 inch by 3 inch round bowl and there was room for about 1 more layer. And, then there is the matter of dippers. Chips, rice crackers, pita bread…lettuce cups. If you have any leftovers, it makes a delicious wrap. 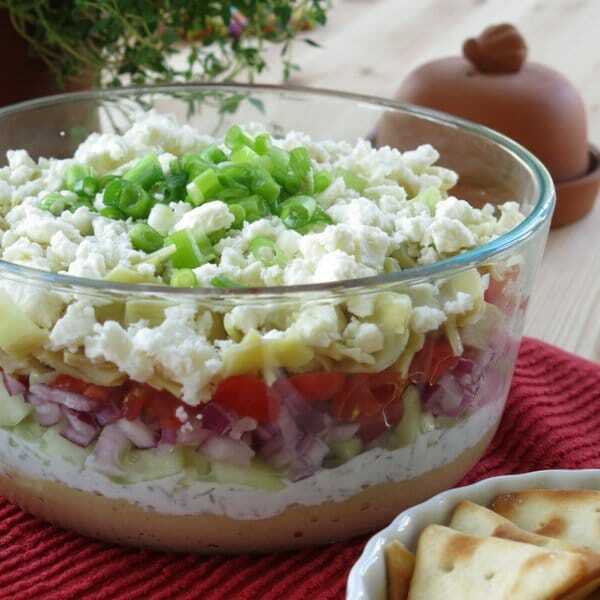 This Greek dip recipe has 7 plus layers of healthy goodness. Make it ahead of time for easy entertaining. Combine ingredients for yogurt dill sauce and set aside in refrigerator while preparing the remaining ingredients. Spread hummus in an even layer in the bottom of the serving dish. Spread yogurt dill sauce on top of the hummus. Evenly sprinkle the remaining ingredients in layers in the order listed. 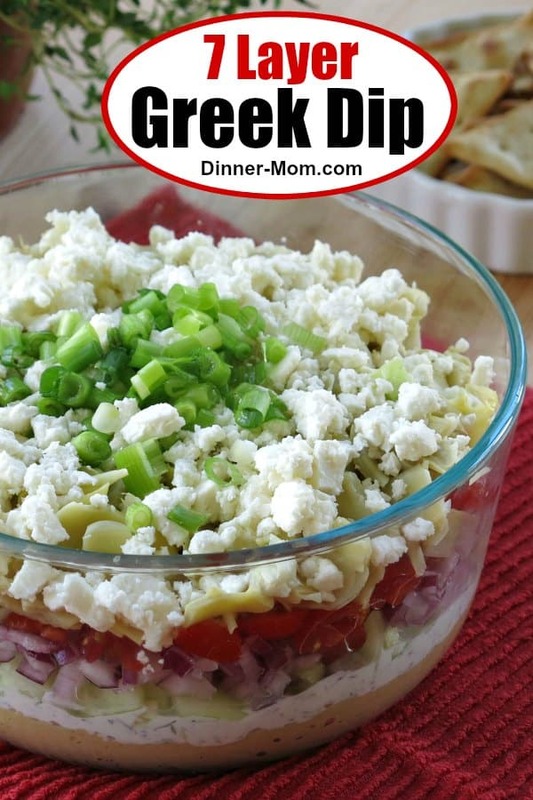 Dip can be made ahead of time and refrigerated. This recipe filled a 7 inch by 3 inch bowl with room for about 1 more layer if desired. Be sure to check out the ideas in the post for more ingredient layers. To keep recipe South Beach Diet Phase 1 compliant, use vegetable dippers such as peppers and low-fat cheese. Alternatively, mix the dip up and enjoy as a salad or in a lettuce wrap. Nutritional estimate is for dip only. Looks fabulous, I am sharing on Sulia!! I love the Mediterranean twist you’ve put on this 7+ layer dip! Look fantastic!! I love everything about this…can’t wait to try. Love all of these!!! So many great recipes to try! Thanks! What a great twist on the typical 7-layer dip. 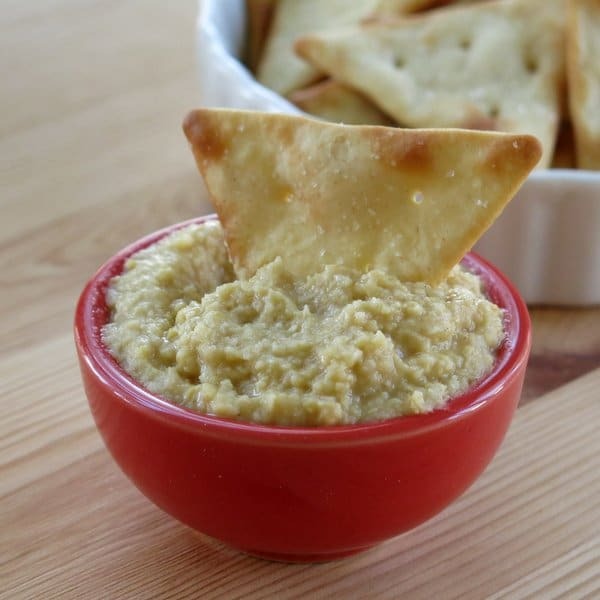 I love the flavors and the idea of dipping down to the bottom to get at the hummus. I make a Mediterranean 7-layer dip similar to this and it is always a hit! I would eat this over a traditional 7-layer dip any day of the week. Man this dip looks good! This dip has my name on it. Seriously everything I love in a dip – perfection! I’ve never seen a 7-layer dip with hummus before. Very creatve! This is a genius idea! I love 7 layer dips! I love the Greek interpretation of this party dip! Humus, tzatziki, and so many other awesome layers? YES! This sounds absolutely amazing. I rarely print recipes, but I’m keeping this. 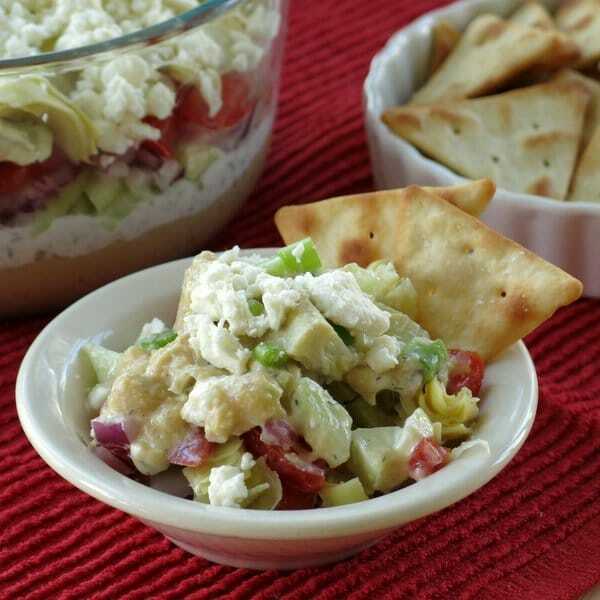 I really need a Greek dip and I love the flavors, with some baked pita chips… Delicious! This dip is not only delicious it’s so pretty too!